← Great Info To Have While Shopping! Sometimes you want full-on onion flavor and odor, sometimes you want to tone that intensity down (like when you’re adding onions to a salad). Cook’s Illustrated, via Cool Tools, says with scientific authority the way you cut an onion can control that intensity. 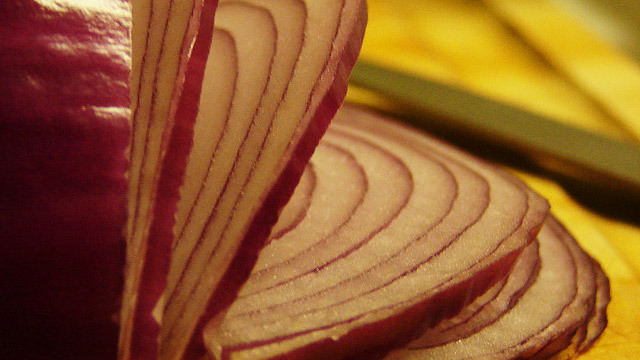 The way you cut an onion affects its flavor. To prove the point, we took eight onions and cut each two different ways: pole to pole (with the grain) and parallel to the equator (against the grain). We then smelled and tasted pieces from each onion cut each way. The onions sliced pole to pole were clearly less pungent in taste and odor than those cut along the equator. So cut with the grain if you don’t want the onion to overwhelm your dish. If you need chopped onions, an alternative is to either soak onions in water before cutting or de-flame them with boiling water. Note; This is true for celery also. Cut on a deep diagonal and it tastes milder. Cut it straight across and it has a peppery taste.